One of the selfish projects that I told you about on Wednesday, was finished in two days. I was inspired earlier this week by the sudden drop in temperature. My hands really suffer from the cold, sometimes when the rest of me feels quite warm. I think it's a side effect of some of the drugs I take, because my feet suffer too, to a lesser extent. As my hands were really painful with cold, I wanted a quick fix to sort things out. I looked around and saw the left over yarn from a cowl I made for my friend (which once again I haven't blogged about, I really must catch you up!). 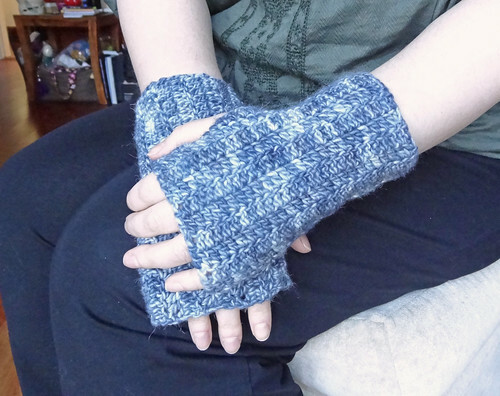 The yarn I used was Araucania Aysen. It's a merino/alpaca/silk mix and it is aran weight. It is gloriously soft and incredibly warm. The left overs seemed perfect for some mitts. I grabbed a 4.5mm crochet hook and got going. I made these. 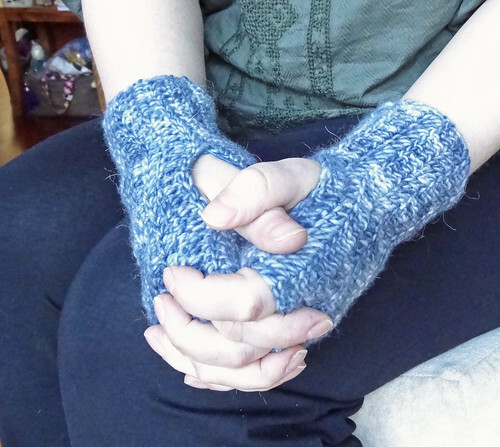 They are so lovely and warm that I can't believe I didn't do this before! I also can't believe how quickly they worked up, but they are just a flat piece sewed up the side with a gap left for the thumb. I used around 50g of this aran weight yarn which equates to approximately 90yds/97m, and a 4.5mm hook. I've used the abbreviation DC to indicate a US double crochet. In UK terminology this equates to a treble stitch. Ch31, turn DC into 4th loop back and DC into each chain until the end of the row. Ch3 turn. DC into 2nd DC, from the previous row, back. DC into each following DC for the rest of the row. Repeat last instruction until 18 rows are created and then cut the yarn leaving approximately 12" before pulling it through the last live stitch on the hook. Match together the top and bottom edges of the rectangle (the top being the edge just worked on and the bottom being the beginning chain row). Using a tapestry needle threaded onto the long piece of yarn, whip stitch over edge to edge for 12 DCs, ensuring both the starting stitch and the finishing ones are secure by sewing over them several times. Run the yarn down a further 8 stitches, by whip stitching over only one of the edges, and then secure the next stitch with the matching one on the opposite edge, by looping over both stitches several times before using whip stitch over both edges to the end of the row. At the end of the row secure the stitch by duplicating it several times. Run the yarn through the fabric of the mitts in two directions to ensure it is anchored before trimming. Sew in the starting tail of yarn in the same way. And there we have it. 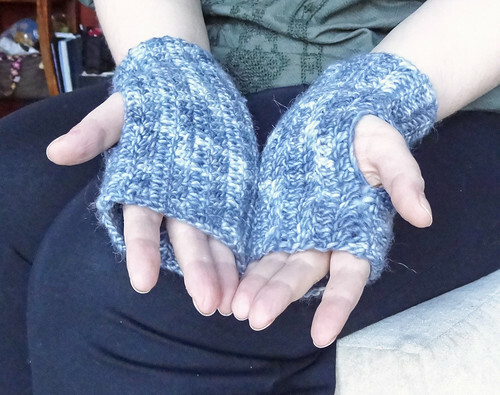 A a pair of warm and soft crocheted mitts to stop my hands freezing while I type. To be honest, I've put the instructions here so that I can do it again if I need to, without having to work it out again before I start! I'm sharing this with FO Friday, which you can check out by clicking a button.